It’s easy for drinkers who love whiskey to be ignorant of just how much spirit one can now find on the market from microdistilleries—even micro or craft distilleries in their own backyards. Unlike say, the craft beer market, when one visits an upscale “whiskey bar,” it’s rarely the local craft distillers who are being most prominently featured. The large-scale distilleries continue to produce the market’s most sought-after products for simple reasons of time and economics—they can afford to make whiskeys with big age statements and a huge commitment of resources, and they occupy the most sought-after places on liquor store shelves. Microdistillers who have only been in the business for a few years? They can’t exactly compete with that. The answer, then, would seemingly be to instead embrace those qualities that can make their products distinct and memorable. A craft distiller’s portfolio should stand out as unique, or reflect its place of origin, and that’s what you find in the three whiskeys from Yellow Rose Distilling. I was recently able to taste this Houston microdistillery’s three flagship products—a blended whiskey, a bourbon and a straight rye—and found each of them fascinatingly unique and reflective of their Texas home. So in short: This is Yellow Rose’s value or “bottom shelf” offering, but it stands up well against its competitors. On the nose, you get some booze, and a hint of green apple fruitiness. On the palate, it’s lightly grainy, corn-dominant and not lacking in residual sugar. There’s some moderate heat and booziness on first inspection, but after tasting the other two whiskeys it seems like the most restrained of the bunch, albeit fairly sweet. The intensity of those flavors is on the lower side, and there’s nothing off-putting or chemical about the alcoholic presence—it’s simply cheap booze, but blissfully free from the grating artificiality and off-flavors that most blended well whiskeys suffer from, at least in comparison to genuine bourbon or scotch. In fact, if I tasted this completely blind, I don’t even think I would peg it as a blended whiskey—more likely, I would have called it a light, fruity, sweet, cheap (but dependable) bottom shelf bourbon. And for a blended whiskey, that’s pretty decent praise. This would be at home in just about any mixed drink calling for cheap whiskey. You wouldn’t really drink it straight, but that’s not what blended whiskey is truly for, anyway. I found that both the bourbon and the rye from Yellow Rose had one unique quality that immediately made them stick out in my mind, signature flavors that you don’t run into all that often in either style. The bourbon, Outlaw, is a 100 percent corn whiskey, which immediately makes it somewhat unusual … but certainly not unheard of, as I just sampled a different Atlanta-made 100% corn bourbon a week prior. It carries no age statement, but the process of aging has been accelerated through the use of 10 gallon barrels rather than standard, 53 gallon full barrels. The increased surface area thus leads to shorter aging times, as more liquid is in contact with the wood at all times, in a practice that has become standard for microdistilleries that need to get aged product on the market without waiting for years. There is of course debate on whether the smaller barrels are a shortcut, but that’s the nature of the industry. In the bourbon, they yield a brash, expressive, larger-than-life whiskey. The proof is 92, but it packs bottled-in-bond wallop. What surprised me in particular was one specific note on the nose: Smoke. Despite no mention whatsoever of smoke anywhere in the literature or description of this whiskey, it features a definite smoke note, a meatiness that pairs nicely with its spice and deep toffee richness to conjure something like a mesquite BBQ—which would make perfect sense, given the Texas origin. I mention spice, and that is definitely prominent as well—it’s actually a bit more peppery than the rye, which I personally enjoy. It’s the biggest, boldest, richest whiskey in the Yellow Rose stable, and as I sipped my dram, my mind returned again and again to the image of cowboys, out on the trail. This is a warming whiskey for a cool night and a campfire under the stars. This straight rye is unusual on several fronts. 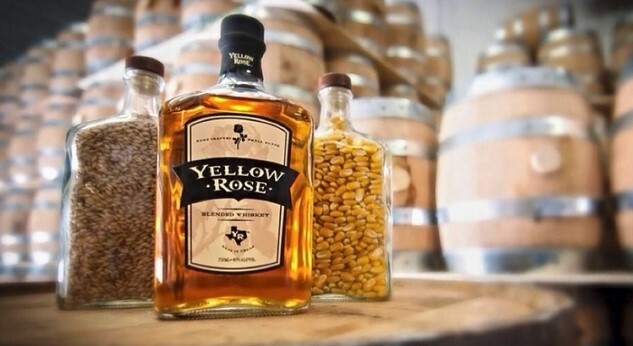 It’s not distilled by Yellow Rose, but by multiple distilleries in both Texas and beyond before being blended into a unique product by the Yellow Rose team. All of the 95-100% rye whiskeys in the blend are at least 2 years old, which allows the “straight rye” labeling, although most are 4 years old. Like several other notable ryes on the market (Bulleit Rye, for example), it’s bottled at 90 proof. Unlike many of those ryes, however, this one isn’t really a spice bomb. There are certainly some pleasant baking spices, peppery and cinnamon, prickling on the tongue, but what stands out more are interestingly fruity and herbal character. Honeycrisp apples, caramelized in brown sugar meets an x-factor note: Mint? I’ve never really had a rye whiskey that I would characterize as “minty” before, but as a hard-to-place herbal note working on the back end of the palate, it works surprisingly well. The more I sample this particular dram, the more I want to experiment with it in the classic cocktails that call for rye—old fashioned, Manhattan, sazerac, etc, where its well-balanced and complex nature would likely shine. It’s the best overall whiskey in the Yellow Rose line not because of bombast but because of subtleties. Jim Vorel is Paste’s news editor. He believes whiskey reviews are the new beer reviews. You can follow him on Twitter.